FunSports challenge videos are scientifically designed physical activities developed after extensive research by American Universities and Physical Education experts. They are fun and engaging but also deceptive and proven to induce a higher level of physical activity among children. FunSports is a fun way of motivating and inspiring children to get physically active and thereby adopt a healthy lifestyle. Sustained FunSports among children would train them to acquire physically fit, mentally alert and emotionally balanced overall personalities as they grow and excel in their future careers. A child who becomes physically active under the aegis of FunSports, learns to focus, persevere and self-challenge. This has a salutary effect on the child’s general performance and overall personality, leading to physical fitness, academic focus and emotional balance. Accordingly, NAC helps to transform an inactive lifestyle into a physically active lifestyle, resulting in healthier and happier future generations that are confident, intellectually strong and professionally successful. What is a "FunSports" Challenge video? 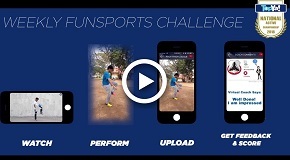 A FunSports challenge video is a fun filled unassuming physical activity assigned to the student by NAC. It could be any physical game/exercise, martial art technique, ball handling, and juggling from any ball sport, yoga lesson, callisthenic body movement etc. Such physical activities tend to become a great family fun moment as well. Parents, children, and siblings start competing with each other while having fun. "FunSports" Challenges: These are Instruction based FunSports challenges with pre assigned points. FreeStyle Challenges: NAC allows a user to show their creativity & skills. In Freestyle challenges a student can create and upload their best creative move that induces physical activity, it can be a Dance, Freestyle Activity of any sports etc. A user gets a bonus scores depending upon his creativity and performance between 1 to 20 points.